We are known for our Premium Quality NON-GMO Sweet Corn, which is picked fresh every morning, all season. Typically our corn season is 4 months long: July, August, September, and October. We grow around 70 acres of sweet corn yearly, most of which is sold exclusively at our market. We have always, and still strive to find the best varieties through extensive trialing and customer feedback, leading us to the sweet corn program we are proud of every year. We grow over 30 different varieties of sweet corn, which we then break down into 6 types for labeling in our market. There are a few reasons for so many varieties. The first reason is that we have proven that some varieties grow better in cold weather and some hold out better in hot weather. For example, a Super Sweet Yellow you have in July may look or taste slightly different than a Super Sweet Yellow you have in September. We also mix up different maturity dates in plantings throughout the spring, so that the days of ripeness are spread out very accurately throughout the 4 month season. And finally, we try to have a lot of variety daily in our market for customers to choose from. Some varieties are very sweet and crisp, and some are mild, tender, and more traditional corn flavor. Typically on weekdays we mainly stock our most popular 2-3 varieties, and on weekends you can have find up to 6 different types. These 6 types are listed below and explained in more detail! Our most popular variety. Medium-Large sized cobs, that are High sweetness and quite crisp. This variety has it's own unique taste and has a mix of yellow and white kernels. This variety is not available in the first few weeks of the corn season. Once it is available, count on it being in our market every day until we are done for the year. Our second most popular variety. Medium-Large sized cobs, that are High sweetness and quite crisp. This variety has it's own unique taste and has all yellow kernels. Like the Peaches and Cream version of Super Sweet, this variety isn't available until a few weeks into the season and then is available most days. Very similar to the other Super Sweets. Medium-Large sized cobs, that are High sweetness and quite crisp. This variety has it's own unique taste and has all white kernels. We do not grow an abundance of this variety, but only for the reason that it has not been promoted as much over the years. It will be available on select weekends throughout the season, and we strongly suggest trying some if you get the chance! This variety is technically a Super Sweet Yellow, but decades ago we gave a couple specific varieties of Super Sweet Yellow their own "Crunchie" name due to their intense texture. Large sized cobs, that are High sweetness and have extremely Crunchie kernels. This variety has it's own unique taste and has all yellow kernels. Over the years we have recommended it as being the best freezer corn, however other Super Sweets are also just as good for freezing. As per popular request by some customers, we continue to grow it. This variety is not grown in abundance but will be available at multiple times throughout the season. We recommend giving it a try if you get the chance, but be warned of how Sweet and Crunchie it really is! This variety is our 3rd most popular. Small-Medium sized cobs that are Medium-High sweetness and tender. This variety has it's own unique taste and has yellow and white kernels. This variety is always the first variety we have available at the start of the season. Many find these varieties to have a more traditional corn flavour. Regular Sweet varieties are slightly less sweet and typically smaller than the Super Sweet varieties. Don't get the wrong idea with this variety though, it is still quite sweet and can be decent sized cobs, it just cannot be compared to the Super Sweets in those regards. A lot of our customers actually prefer it all season long, and for that reason we grow a fair amount of it and try to keep it available in our market most days of the season. This variety we currently grow the least amount of. 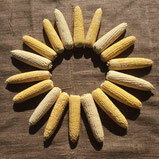 Small-Medium sized cobs that are Medium-High sweetness and tender. This variety has it's own unique taste and has all yellow kernels. It is very similar to Regular Sweet Peaches and Cream. For our fans of Regular Sweet we supply this one a few times throughout the season. While some really like this variety, it isn't grown in abundance because most customers prefer one of the other 5 varieties. You may find this variety at the start of the season or at a few times throughout the season, and is worth giving a try if you get the chance! Above are guidelines for how our season and varieties are planned out. Please keep in mind that it is a fast paced operation that can change daily, and is also affected by the weather. It is possible to call the market directly for variety availability, however we do prefer just to come in as you are always guaranteed a good product. During the first few weeks of the season, we can sometimes run low or sell out, and we may not take any orders during that time. Once we are in full swing and most varieties are ready, we take orders at the market for 1 sack minimum, 1 sack is 4 dozen cobs. We take 1-10 sack orders with at least 1 day notice. We do orders above 10 sacks for large events, orders of this size are usually run by the field manager before confirmation. We do our best to please every customer! If you have any further questions, check the FAQ section or send us an email! Thank you and enjoy!